The 6lb lump of ambergris could be either vomit or feces. 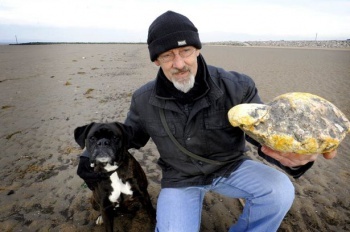 Mr. Ken Wilman, out walking his boxer Madge, found a disgusting lump of mottled yellow rock. Naturally, he left it on the beach. "I didn't actually realize what it was at first and I couldn't understand why Madge was so interested in it," he later told the Mirror. "It smelled horrible. I left it, came back home and looked it up on the internet. When I saw how much it could be worth, I went back and grabbed it." Wilman was right to do so, because he's already been offered Â£43,000 ($68,000) by a French dealer for the gunk. That's because the 'rock' is actually ambergris, a stomach product of the endangered sperm whale, and completely vital to the manufacture of some very expensive perfumes and crÃ¨mes. Wilman intends to send a sample to France to be tested - if it is the good stuff, which depends on how long it has been floating in the ocean, then it could be worth as much as $180,000. A buyer would then age the ambergris and make it into perfume. Wilman said of the whole experience that "It is like walking on the beach and finding a bag of Â£50,000 in cash." Sperm whales are an endangered species, so traffic in ambergris is highly regulated in many countries including the United States. Scientists believe that ambergris is formed in a sperm whale's digestive tract around hard objects, like inconveniently swallowed giant squid beaks, to keep them from doing damage. If the produced lump is small, it gets passed through like feces, if not, the whale vomits it out. Ambergris has been used to produce culturally important perfume in Europe for thousands of years, to the bafflement of people everywhere.